Americans gave more than $373 billion to nonprofit organizations in 2015, a 1.6% increase over 2014. And in 2016, overall online revenue grew by an astounding 19%. This shows there’s no question about whether the money is there. The real question is: how can you create a digital strategy that inspires people to support your cause and facilitates continued growth? Consider this. In 2015, 13% of online gifts were made from mobile devices. This figure alone demonstrates how important it is for nonprofits to focus their budgets where their donors are. By optimizing for mobile, you’re making the act of giving easy for your donors. If you make the whole experience seamless and enjoyable—it’s more likely to happen again. Email is the best way to reach your donors on a personal level. They can open, skim and re-read at their leisure. Email fundraising grew by 25% in 2015—even though open rates, click-through rates and response rates were down. This growth can be attributed to a higher volume of outgoing messages. Nonprofit email lists grew by 14% in 2015, and nonprofit organizations responded by sending more fundraising messages. For top-performing nonprofits, more than a third of their online revenue can be tracked to a specific email appeal. Specifically, top-performers averaged 27 fundraising appeals per subscriber last year, while other nonprofits averaged 16. In simple terms, more frequent asks were rewarded with higher revenue. In fact, email giving accounted for 29% of all online revenue last year. Messaging should never be one-size-fits all and data can help you better understand your potential donors. The more you know about your donors, the easier it will be to create segments and deliver personalized messaging that stand out. It’s estimated that only 34% of nonprofits use age and birth year data in their targeting strategy. This is why adopting an inbound data-driven strategy is key. Inbound marketing focuses on nurturing leads all the way through the donor journey. The goal is to deliver the right message at the right time, ensuring that your message is relevant and welcomed, instead of interruptive. When potential donors see your ad on Facebook, it’s the difference between an eye roll and a click. Traditional outbound marketing allowed businesses to talk “at” their target audience. Inbound feels more like a two-way dialogue because each interaction is more meaningful and the likelihood of engagement is higher. This is why inbound is more effective when it comes to increasing website traffic, lead generation and even donor loyalty. Remember, the relationship shouldn’t end after a one-time donation—you want these supporters to keep showing up for your cause. It almost always costs more to attract new donors than it does to retain existing ones. By keeping them engaged through relevant email content, you may end up with some passionate new brand evangelists. When it comes to driving traffic to your website or landing page, search advertising is a must. And if your organization hasn’t looked into Google Ad Grants yet, now is the time. When you get started with Google for Nonprofits, your free membership includes a $10,000 monthly grant towards search ads. These ads reach far and wide to raise awareness among people searching for related keywords. 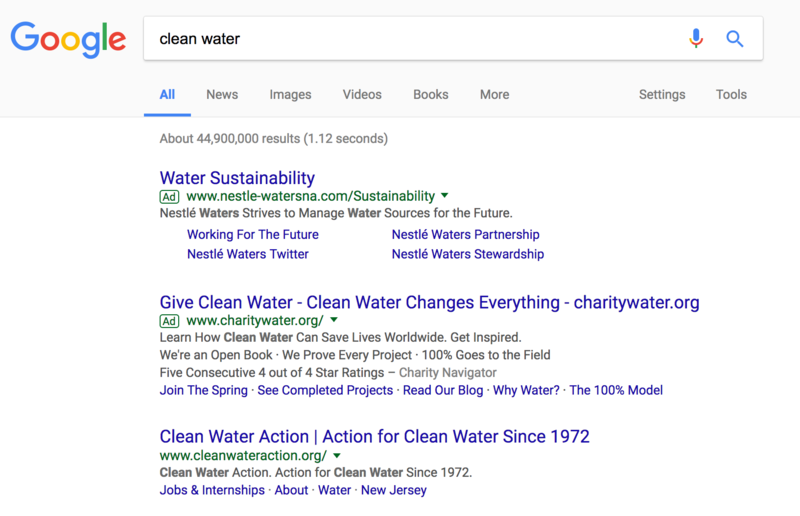 For example, someone searching for “clean water” might see an ad for a water purification organization. These search ads alone are estimated to drive between 10,000 and 40,000 new website visitors to your website each month, so it’s perfect for reaching donors and volunteers. By driving to your content-rich landing page, you can increase your web conversion rates whether that means email acquisition, donation collection, or volunteer registration submissions. Is retargeting already part of your strategy? If not, it could make a big difference. Essentially, retargeting keeps track of who visits your website and then “follows” them as they browse the internet. 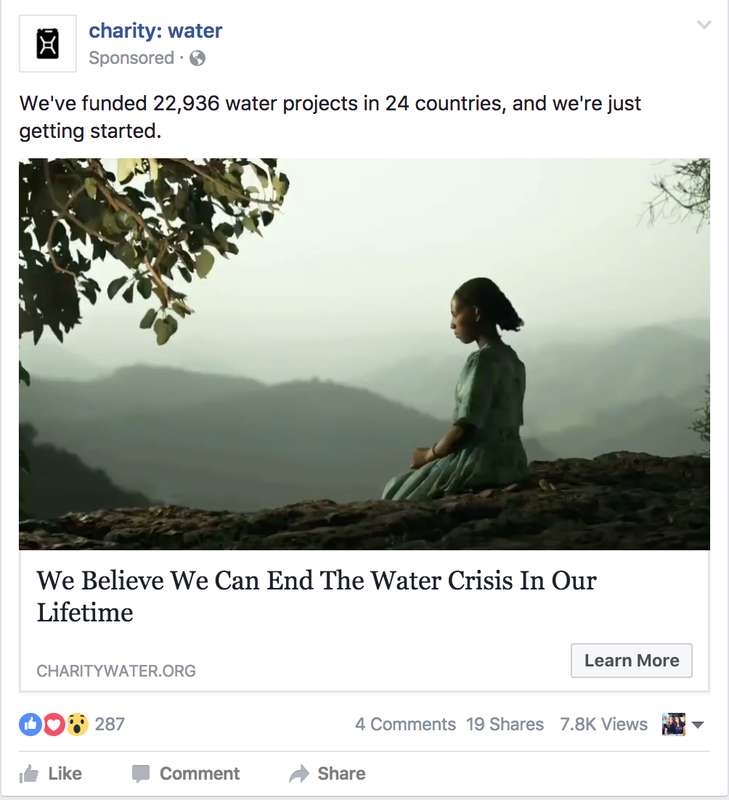 Let’s say you clicked on the Charity Water Google ad and saw an ad for Charity Water a few minutes later on Facebook. That’s retargeting hard at work. Surprisingly, only a small number of visitors will make the decision to donate the first time they see your website. Retargeting is what keeps your cause fresh in their minds and brings them back to your site. Every time someone sees your retargeting ad, you’re building brand equity and cause awareness while presenting a new opportunity to get involved. These ads are most effective when they’re tailored specifically for your audience and they have a clear call to action. Buttons like “donate now” or “get involved” work well for these types of placement because they’re clear, actionable and are digestible at a glance. As online giving continues to grow, it’s important for nonprofit organizations to consider ways to refine their overall digital strategy to cultivate new donors. By optimizing for mobile experiences, rethinking your targeting practices and delivering more meaningful messages, you can keep your donor base engaged at every touch point—inviting them to become loyal supporters of your cause. Insights from M+R Benchmarks Studies. Magnifyre partners with nonprofits to help you to reach more donors, touch more lives and look forward to a better tomorrow. Contact us to estimate your digital marketing ROI and increase the impact of your organization.